As substantial soups go, this one happens in a hurry: literally in the pot and on the table in well short of an hour. 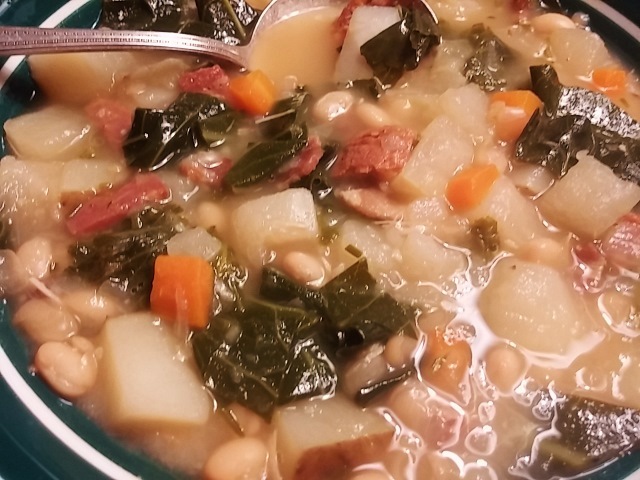 It’s similar to Spanish caldo gallego, a northern specialty made with white beans, collards or other greens. Traditionally, there’s a smattering of mixed pork including chorizo, ham, and unto—an uncured bacon similar to pancetta or salt pork. In this case, I’m content with a couple of meat items. I like to start things off with a little smoky bacon and follow up with slices of Spanish chorizo, a cured sausage flavored with Spanish pimiento, garlic, and herbs. Because we have pockets of Basque communities in Oregon, we are fortunate to have access to excellent chorizo and other specialty products. It is far different from Mexican chorizo which is uncooked, very fatty, and derives its flavor from cumin, chile powder, and vinegar. Because the Spanish version is also rich and highly seasoned, it doesn’t require as much as one might expect; I can often get by with one sausage. Rendering it ahead also controls some of the greasiness it exudes. If I have a little ham, I’ll throw that in, too. During the cooking process the potatoes and turnips begin to breakdown and it thickens into a chowder-like substance. Any dense greens will do; I especially like collards here for their distinct, well-rounded heartiness. The white beans are part of the equation that make this soup work; they add a dimension that would be missed without them. In spite of some very big flavors, for me, it is the addition of the sweet, earthy turnip that brings it all together. Pull out your favorite country bread and dive in! In a soup pot, sauté the bacon to render the fat; drain all but 1 tablespoon fat. Add the chorizo and do the same. Add the onion to the pot and cook to soften; stir in the garlic and cook until aromatic. Pour in enough liquid to cover the bottom of the pan and scrape lightly to loosen any bits adhering to bottom of pot. Stir in the potatoes, turnip, bay leaf, and toss to distribute evenly. Pour in remainder of the liquid, bring to a boil, and simmer until potatoes are tender, 10-15 minutes. Stir in the beans and the greens, season lightly with salt and pepper, and return to a boil; simmer 10-20 minutes longer. The soup should thicken as the potatoes and turnips break down. Adjust seasoning. Serves 4.